straight from the beauty dept. I had breakfast with Kristen Ess, hairstylist and founder of the cultish beauty blog, The Beauty Department the other day. 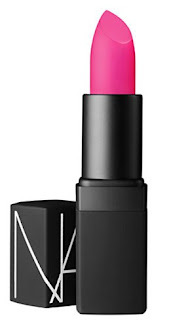 She was wearing this bright fuchsia pink lipstick that I could not take my eyes off of. The color is unabashedly feminine and downright fun, and it complimented her skin tone, but it also made her whole look (outfit and all) pop. And I like that it's a departure from all the crimson lips we've been seeing. It may just be my new lip shade. AH Schiap! This color should just be sold along side every navy ensemble. I've worn the color for over a year now and have gotten so many of my friends addicted. You will love it! I desperately wanted this to be "the lipstick" "the game-changer" "the one that would make me in all my humdrum clothes all-of-a-sudden impossibly chic." Alas it was not to be. I went to Sephora to a Nars event and requested SCHIAP. At the same time another woman in the chair next to me also requested SCHIAP. She outSCHIAPed me! She left Sephora SCHIAP in black and white bag and I looked like I had overdosed on pepto bismol. Crestfallen I satisfied myself with a tube of YSL touche eclat.